A few weeks ago Mark and I went to Waterton for a night to relax. This being the fall, there are only two hotels open and only one served food. Usually, Waterton is a ghost town this time of year, everything is boarded up and the tourists are long gone. Therefore, when we went to get supper we were stupefied by the amount of cars in the parking lot. Was it a wedding? We were soon brought to a halt by the outline of a body on the floor of the lobby. 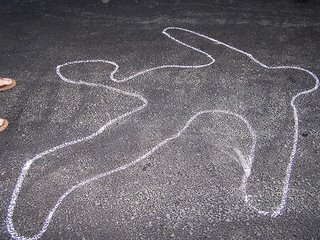 Had we stumbled onto a crime scene? We quickly looked at each in excitement! All the cars must be paparazzi staking out a good story! Suddenly, I was Nancy Drew and Mark was Joe Hardy, and we were flatfoot ready. We both had read enough of these classics to know how to do important sleuthing things. Dust for finger prints, question crazy scientists, how to avoid bear attacks, and most importantly how to trail bad guys. Especially, the trailing bad guys. With the streets of Waterton completely dead we would have to use all our tracking skills to bring the villain to bear. We felt excited to be so close to danger! But sadly, our short career as the people who explain the whole crime to the police were dashed when we realized that the resort was having a Murder Mystery weekend. Posted by Heidi Schempp Fournier at 7:19 p.m.